The Frugal Family Life: $1/1 Hinode Rice = FREE at Nichols! 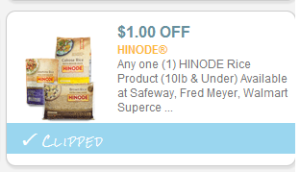 Head over to coupons.com, change your zipcode to 84042 (Utah) to find a $1/1 Hinode Rice coupon. These are regularly priced $1.99 at Nichols so with this coupon it will be FREE!